Image: Local residents convened on July 18, 2016 at Kalanianaʻole Hall to discuss the future of Moloka‘i in a changing climate. Guests included Dr. James Jacobi (USGS Pacific Island Ecosystems Research Center), Dr. Paul Hosten (National Park Service), Dr. Tom Giambelluca (University of Hawaii Department of Geography), Nancy McPherson (Department of Hawaiian Homelands), Glenn Teves (UH College of Tropical Agriculture and Human Resources), Jeannine Rossa (Ecolink Consulting), Dr. Stephanie Dunbar (The Nature Conservancy), and Dr. Bradley Romine (UH Sea Grant). 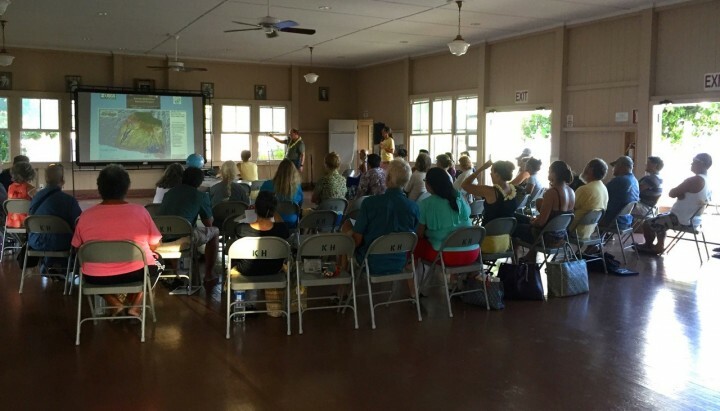 On the evening of July 18th, 2016, local residents gathered at Kalanianaʻole Hall for a community meeting on climate change and its potential impacts on Moloka‘i. The evening was organized by Ka Honua Momona (KHM), a community-based non-profit organization that works to steward Molokai’s environmental and cultural resources. The event included highlights from a series of climate change workshops held over the last two years in Moloka‘i, featuring invited climate scientists, environmental educators, and resource management specialists. Envisioned and led by KHM, these workshops have been part of the Moloka‘i Climate Change Collaboration Project, funded by the Pacific Islands Climate Change Cooperative (PICCC). Monday evening’s community meeting was structured around the anticipated impacts of climate change on Molokai’s land, ocean, and people. Community members discussed the local implications of climate projections with each other and with the meeting’s guest scientists and resource specialists. Stories of hope were also shared. 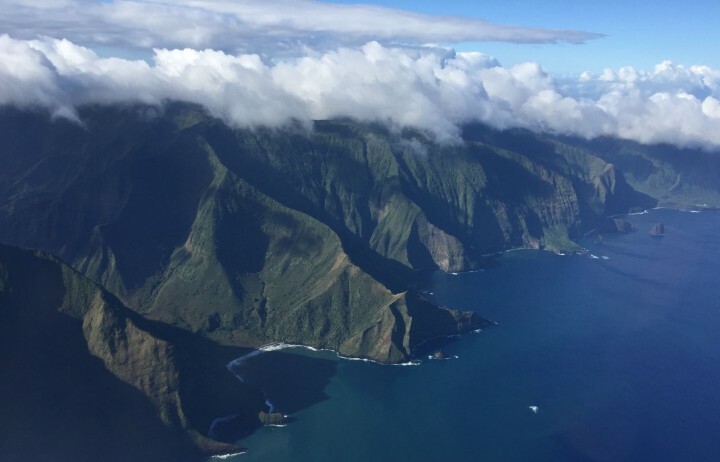 Dr. Paul Hosten of the National Parks Service compared past and present-day images of Kalaupapa National Historic Park, and showed the progress made in restoring native vegetation. Molokai’s kūpuna shared their wisdom both in person and through the medium of film, in a documentary produced by KHM on local experiences with environmental change in Moloka‘i. This was the first showing of the film, and KHM is incorporating local feedback from the meeting into the final editing. 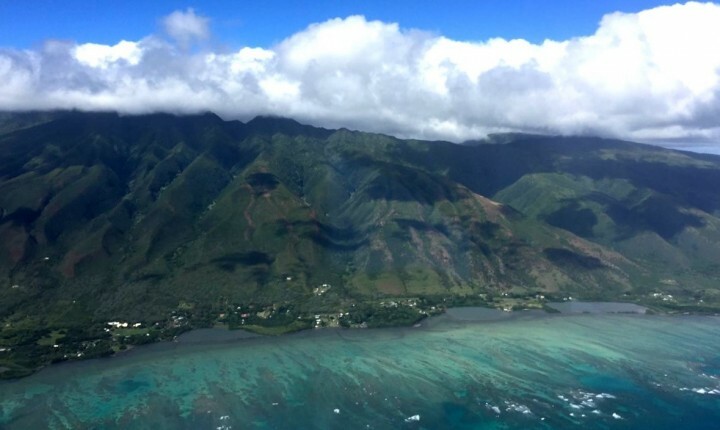 At the end of the meeting, one underlying question remained: “What’s next?” The question had been a common thread through Molokai’s climate change workshops, and KHM had compiled ideas that arose during these workshops in a handout that was shared with participants. There was agreement for the need for action, and people discussed where funds might come from to support climate change resiliency in Moloka‘i, and how to enroll the support of partners and government agencies. People signed up to be involved in follow-up meetings, beginning next month.